Custom Printed Tissue Paper at Low Minimum of 10 reams (480 sheets in a ream) Call 1-800-426-5708 for details. The Most Economical Advertising Tool! Available in an all over scatter print. These high quality sheets of tissue paper can be printed in any PMS color. Just send us one sample of the image you want reproduced! Print Your Logo or Name on Tissue in a Scatter Print. Approximately 1" between logos, 1 1/2" from row to row on a 45º angle in a brick pattern. Approximately 1" between logos, 1 1/2" from row to row on a 45º angle in a brick pattern but going in the opposite direction of A. 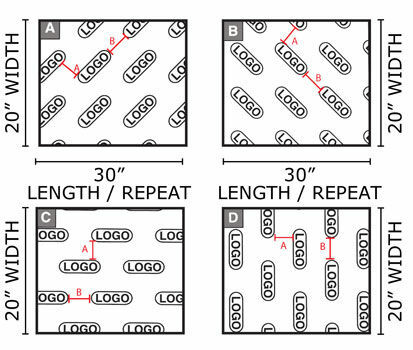 Approximately 1" between logos, 1 1/2" from row to row in a horizontal brick pattern. This is for your specs, if one of our boxes does not create a layout desired. Please make sure you indicate set dimensions. May incur additional costs-please call. Please indicate which design you would prefer. Plate Charges: $330.00 to $600.00 for orders of 20+ reams. Based on a 25% ink coverage.